Not only does painting personalize one's water blaster, but it can also seriously intimidate one's inexperienced opponents. ...besides, only a water-blaster-maniac would paint their blasters, right?! ...RIGHT! Not all may wish to recolour their weapons and paint can actually get expensive depending on type and amounts needed. One can also personalize one's weapon by detailing it with water-insoluble markers or paint. 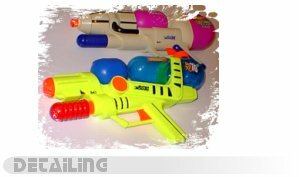 Water blasters tend to be made up of moulded plastic with many features which disappear since they are all made of the same coloured plastic. To make one's weapon look a little more stunning, key areas of the plastic should be highlighted (usually by colouring regions using a black marker/paint).